Volker Remmert has written: ‘By the middle of the seventeenth century, pictorial representation [in frontispieces] played a significant role in the Copernican debate’ (2006). Indeed, astronomy was a ‘hot topic’ in the 17th century and authors used frontispieces as a way to communicate and legitimise their standpoint on scientific debates. 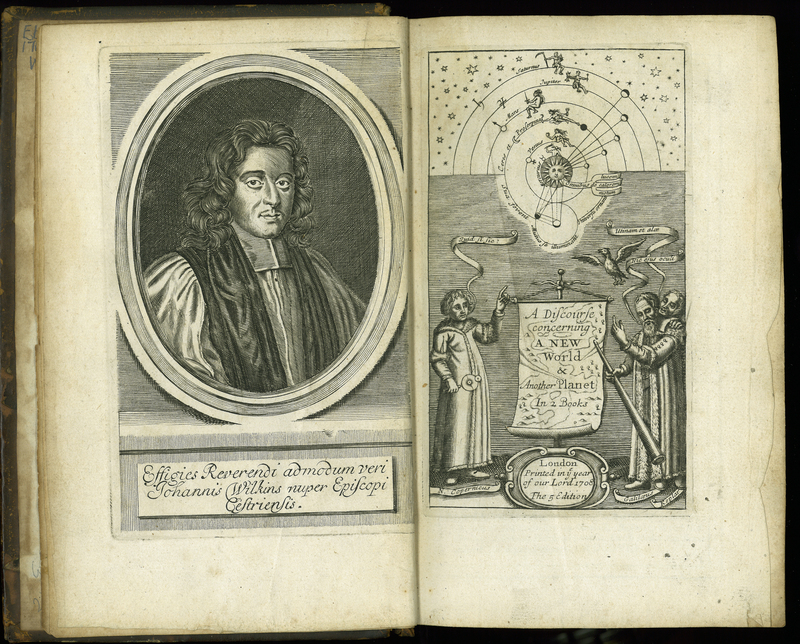 Here, John Wilkins (1614-72), polymath, theologian, and latitudinarian, is stating emphatically, through these images, that he supports and is promoting Copernicus’s ideas on heliocentrism. Copernicus, Galileo, and Kepler, all heliocentrists, stand beneath an incomplete, yet decorative model of the solar system. ___, “The Mathematical and Philosophical Works of the Right Reverend John Wilkins, Late Lord Bishop of Chester. Fifth edition,” ourheritage.ac.nz | OUR Heritage, accessed April 20, 2019, http://ourheritage.ac.nz/items/show/10650.